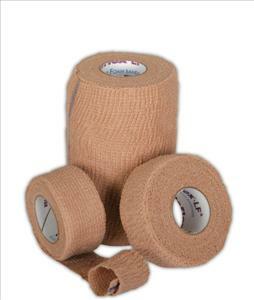 A unique quick stick self-adhesring bandage with a soft foam texture. Latex-free but performs better than latex. Patented hand tear technology. Acts as a secondary dressing without the need for clips or tape. Will not constrict. Bandage measurements are for stretched length. Sterile, Latex-free, 3" X 5 YD. Case of 20.